In dystopian science fiction, overbearing police states have cameras and sensors perched on everything imaginable— like buildings, lamp posts, human bodies, and....fake desert flora? 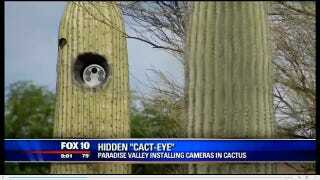 A local Fox affiliate in Paradise Valley, Arizona, reports that over the past few days the town has been quietly installing license plate readers in fake cacti around town. Although fake plants have been used to hide unsightly telephone poles for example, cameras would definitely be a first. Local officials say the cameras aren’t meant to be a secret, just a purely aesthetic decision spurred by lack of light poles in the area. That would all be fine and good if license plate readers weren’t contentious technology as it is. The ideal purpose of LPRs is to track cars in order to aid in amber alerts and traffic violations. The problem with that is its well know that government is using the technology to track millions of cars, an incredibly small amount of license plate “hits” even amount to anything, and just this week, a man sued police for unlawful use of LPRs.